President Obama is clearly concerned about the direction of the country and the mainstreaming of anti-Muslim hate speech, especially in the context of impossible-to-prevent lone wolf attacks like that at Orlando. He launched his fiercest attack yet on Donald Trump and warned of a repeat of the worst moments of American history, when the Federal government targeted our fellow citizens. Aspects of the speech made me uncomfortable. Obama seems to have bought the story that Omar Mateen, the alleged Orlando shooter, had become self-radicalized by the internet. I have long been suspicious of this discourse, and in any case I doubt Mateen learned much about radicalism from the internet. He didn’t even seem to know that Hizbullah is a fierce opponent of ISIL on the Syrian battlefield, and said he was a member of both. Even a little cursory reading on the internet would have allowed him to avoid this . . . faux pas. Instead, the evidence is that Mateen was himself a closeted gay man who frequented the Pulse club, and very possibly lost a lover, driving him over the edge. The invocation of ISIL was meaningless. Obama, having accepted the radicalization narrative, went on to speak about how his administration is rolling the actual ISIL back in Iraq and Syria. He pointed out that ISIL has lost 50% of the territory it had in Iraq, and that it is about to lose Manbij in Syria, which will cut off the capital of the phony caliphate, al-Raqqa, from supplies and reinforcements coming in from Turkey. All this is true. Daesh or ISIL is being rolled up and it is a little unlikely we’ll be talking about it a couple of years from now. But Muslim radicalism isn’t being rolled up, and it will just take on a different name and identity. GW Bush’s killing of Abu Musab al-Zarqawi in 2006 did not destroy the budding Islamic State of Iraq. US or Iraqi military strike that dispatched ISI leader Abu Omar al-Baghdadi did not destroy the movement, then the Mesopotamian affiliate of al-Qaeda. Obama’s assassination of Usama Bin Laden had no effect on the holy warriors in Syria who idolized him. So killing Abu Bakr al-Baghdadi (Ibrahim al-Samarrai) won’t end ISIL. It will just devolve back into a terrorist group from having been a puritanical state. Obama also shows awareness that radicalism appealed to Syrian and Iraqi Sunni Arabs because they felt mistreated, humiliated and excluded by their governments. Obama expressed confidence about the Iraqi government, ruled by the Shiite fundamentalist Da`wa or Islamic Mission Party, will become more inclusive of Sunnis. What universe is he living in? Then he pledged to continue to support the cessation of hostilities in Syria, which began amazingly well but has gradually fallen apart. Obama’s faith in a post-Daesh political settlement in both Syria and Iraq seems so unlikely as to appear pollyannaish. More likely, some angry and humiliated Sunnis will keep on being excluded and keep on deploying the tactic of terror. But Obama ended his speech by coming back to the domestic issues. “We now have proposals from the presumptive Republican nominee for president of the United States to bar all Muslims from immigrating into America. And you hear language that singles out immigrants and suggests entire religious communities are complacent in violence. 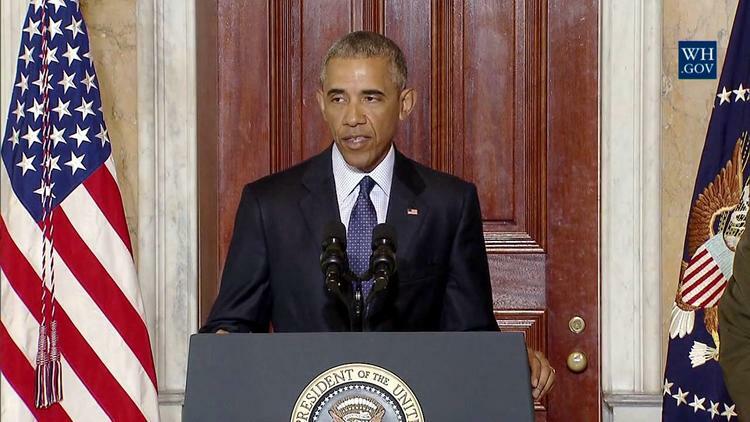 OBAMA: This is a country founded on basic freedoms, including freedom of religion. We don’t have religious tests here. Our founders, our Constitution, our Bill of Rights, are clear about that. And if we ever abandon those values, we would not only make it a lot easier to radicalize people here and around the world, but we would have betrayed the very things we are trying to protect. The pluralism and the openness, our rule of law, our civil liberties, the very things that make this country great. The very things that make us exceptional. And then the terrorists would have won and we cannot let that happen. I will not let that happen. These are noble sentiments and Obama did the right thing in standing up to Trump over his hateful remarks against Muslims. He is right that the strategy of Daesh/ ISIL is to get Americans to mistreat Muslims and drive them into the arms of Daesh. Still, Obama is correct that it is un-American to single out people for special mistreatment based on their religion, or to blame 1.5 billion Muslims for the actions of one unstable man. And it is excellent that he spoke out. It is also a piece of irony, since the Trumpofascists had been implying or saying that you can’t be a good American if you or your parents were born abroad. The president has a loud megaphone, and he has put it to good use in standing up for the Bill of Rights. As he reminded us, undermining the Constitution to get at threats to the Constitution is a fool’s errand.